This iExpression changes a keyframed movement such that it is no more continuous but jumps from one point to the next, where the distance of the points can be choosen with the "Grid Size" parameter. The iExpression can be applied to arbitrary 1D, 2D, and 3D properties. Applied to the rotation of a clock hand, for example, it makes it jump from second to second instead of rotating smoothly. Applied to the position of a 2D or 3D layer, it makes the layer jump from point to point on an imaginary grid. 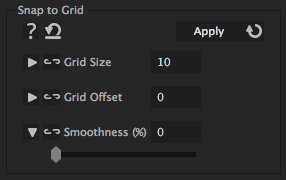 If you want to control the size of this grid in each dimension separately, you can use the "Snap to Grid 2D" or "Span To Grid 3D" iExpression instead. is the distance of the points in the grid (i.e. the width and height of each cell). moves the grid point by the specified amount.